Tefnut Goddess meaning Literally as "That Water", her name has been linked to the verb 'tfn' definition 'to spit' and models of the creation myth say that Atum (or Ra) spat her out and Tefnut Goddess name was written as a mouth spitting in later texts. Unlike most Egyptian gods and goddess , including Tefnut's brother, Tefnut Goddess has no single ideograph or symbol. Tefnut's name in hieroglyphics consists of 4 single phonogram symbols t-f-n-t. Although the n phonogram is a representation of waves on the skin of water, it was never taken as an ideograph or determinative for the word water, or for all things connected with water. Shu and his twin sister were said by the Book of Dead to have but one soul between them. Tefnut Goddess, Shu's female principle, was usually considered the goddess of mist, the source of moisture in the newly created universe. in the story of creation we saw that the eye of Ra, which Shu and Tefnut Goddess brought with them , played a crucial role, but an additional part of the story says that Nun made for Ra a second eye , an act that made the first eye angry . Ra had to use all his diplomacy to keep both eyes content and , as a result, divided their duties. One eye became responsible for the daylight hours and had considerable power and splendor; the second accepted responsibility for the hours of night and also had splendor but less power. This is one version of the myth of the creation of the sun and moon , and often Tefnut Goddess was associated wit h the moon , Ra's lunar eye . Later this clear distinction became well, sometimes being called "the lady of flame." In her role as the eye of Ra she played a part in a very interesting myth that has been pieced together from references at the temples of Edfu and Dendera. Tefnut Goddess became very angry with her father and left Heliopolis for Nubia ( the are now covered by Lake Nasser ) in a very bad mood. There Tefnut Goddess took on the form of an angry lioness and became the terror of the neighborhood, attacking both men and animals. Dragon like, Tefnut Goddess blew smoke and fire from her nostrils and eyes and fed up the flesh and blood of her victims, Ra missed his daughter and perhaps believed that he could use her new-found ferocity to his own advantage against his enemies, so he sent Sh and Thoth as his emissaries to ask her to return home. Thoth, disguised as a baboon- which may account for his later association with the animal - found her first and tried to persuade her that Egypt was a much civilized place than the wild of the Nubian desert. In Egypt , he said , her worshipers would serve up to her on altars the game Tefnut was now having to run down and kill for herself . he described the festivals and joy that characterized Egypt and generally made the case for a superior life there. Shu finally caught up with his brother and joined Thoth in encouraging his sister and mate to return to Egypt. The two gods ultimately prevailed on Tefnut to go home, and her return trip became a triumphant progress through the Egyptian villages. The goddess was accompanied by Nubian musicians, clowns, and baboons; the people turned out to rejoice in her presence, and wild drunkenness accompanied the festivals in her honor. As Tefnut progressed through the villages, Tefnut lost her ferocity and became much kinder and gentler. The myth was presented as an explanation of the civilizing power of culture: while she was in the desert ,she was wild and uncontrollable. but when Tefnut returned to the niceties of civilization, she calmed down and became a good citizen. The myth also reflected ancient ideas about the sun and moon. As the eye-whether it represented at this moment the sun or the moon makes little difference- her absence caused the absence of light, and the people became afraid . her return indicated the victory of light over darkness and was a signal for rejoicing . This story is one version of the return of the eye of the good, a central theme too in the Osiris-Horus-Seth myth. Tefnut was sometimes presented in the drawings in the shape of a woman wearing the solar disk encircled by a cobra. 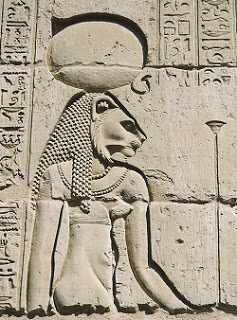 While it is usually assumed that her disk represented the sun, there was nothing about it that might not also have represented the moon.At other times Tefnut Goddess had woman's body and lioness' head, and elsewhere Tefnut Goddess was depicted simply as a lioness. Not much is known about her role in mythology but she did have a place in the court of judgment during the trials of recently departed souls before the gods ,her role was minor, nut the papyri of both Ani Hunefer contain vignettes in which she sites as judge.